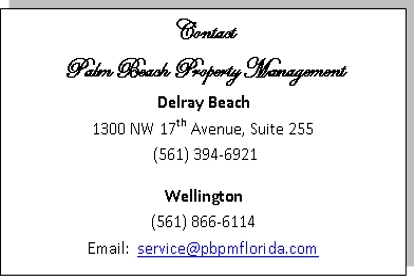 Since 1988, Palm Beach Property Management has managed many of South Florida's finest addresses. We are a boutique-style management company that caters primarily to communities who are looking for the personal touch in a professional environment. We are pledged to give unparalleled attention to detail and personalized service to homeowner associations. Palm Beach Property Management caters primarily to associations with less than 250 properties. Most management companies strive to take on the 1,000-property "super" associations that yield hefty management fees. Typically, with fewer homes managed by these companies often take second place. Not so with Palm Beach Property Management. We strive to develop personal relationships with board members and homeowners to deliver results that form letters, automated phone systems and inexperienced managers cannot possibly achieve. Through effective personal communication handled by managers with a minimum of five years of Licensed CAM experience, communities managed by Palm Beach Property Management have among the lowest delinquency rates in these tough economic times. For more than 20 years, Palm Beach Property Management has been setting "The Standard of Elegance" for South Florida communities. Let us show you the Palm Beach Property Management difference.